The draft-only Beer For Breakfast will be available exclusively at Dogfish Head's Rehoboth Beach brewpub. Back in 1994, long back before Dogfish Head was rolling off the lips of craft-beer fans across the country, founder Sam Calagione started playing around with some organic Mexican coffee, licorice root, and chicory. He eventually devised Chicory Stout, a beer that Calagione credits with launching DFH down the experimental path that’s become its calling card. It’s a mid-Atlantic treat, credited to Pennsylvania Dutch communities who didn’t like to waste anything when they butchered hogs. It started as a clever way to use up all the little bits of pig that were left over once the prime cuts were broken down. Cooked down and then formed into a loaf with cornmeal and spices, it’s usually cut into slices and brown up in a skillet. 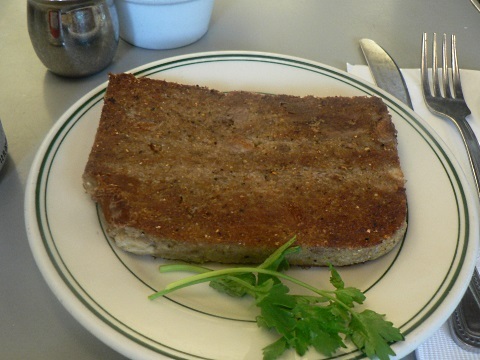 Most commonly, scrapple is served with fried eggs and eaten in the kind of hearty, cholesterol-laden breakfast that we all crave when we’re hungover. Rapa is the world’s largest commercial producer of scrapple, and the company is conveniently located just down the street from Dogfish Head. Everything else is sourced locally. Why get coffee from St. Paul, MN? It’s a nod to one of Calagione’s all-time favorite bands, The Replacements, who hailed from Minnesota. The band also immortalized what might be the anthem for breakfast stout fans everywhere: “Beer for Breakfast.” Calagione liked to listen to it a lot as he mashed in during mornings in 1995. Now for the bad news for non-local DFH fans: This brew will be available only at Dogfish Head Brewings and Eats in Rehoboth Beach, DE starting December 5th. The brewpub is holding a special happy-hour event from 5pm to 7pm on December 5th to unveil Beer for Breakfast. The menu will be scrapple-centric, including scrapple pizza and scrapple eggrolls. Evidently, this beer isn’t just for breakfast. But for people who can eat breakfast at any time of day, it might just be the beer for you—if you’re planning to visit Delaware in time.